In coaching we are co-creating toward a change or shift in your life. In Neuro-Linguistics we have a model for identifying how you are doing something in your life and through careful distinctions identify the underlying “program” that runs it. Through the coaching process we are looking to define the starting point of a behavior or pattern of thought. Combining that goal with the tools of Neuro-Linguistics we can decode what is happening and then recode how it is happening to be more useful and to create more ease. What is your “how I do this” process? The aims of coaching includes understanding the unconscious beliefs that underpin your choices. 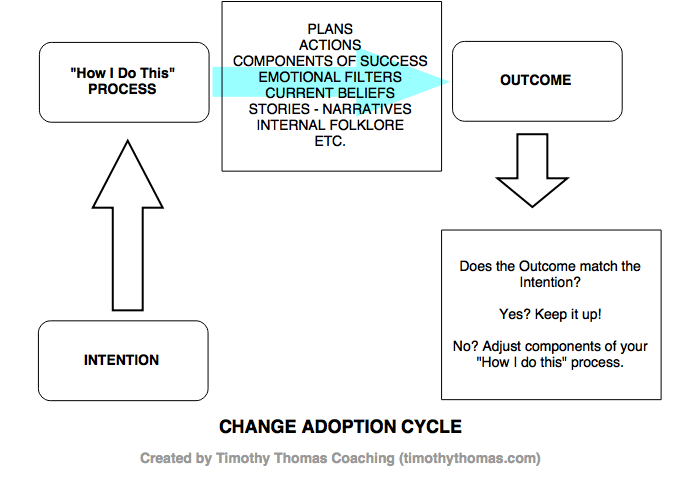 This can help reveal where a change must happen. There are many ways to feel “stuck.” It could be a cycle of distraction that has you doing the same sorts of things over and over. Maybe you have a way of “coping” that shows up right when the most important work needs to be done. Ever sat down to watch television knowing full well there are other things waiting? Or maybe fixing a drink or two, constantly checking Facebook, exploring YouTube, or any number of activities that are not on your critical path? Even house cleaning could really be procrastination in disguise. Are you cleaning at a time that should be set aside for something else? Coaching can lead to awareness of when an activity is really a distraction to numb stress or anxiety. Procrastination rides next to fear. It can extinguish your passion for living and keep you in a vicious cycle of avoidance. When your outcome is not matching your intention then it is time to identify, name, calibrate, and adjust your “how I do this” process. Each person’s process is shaped by conscious and unconscious beliefs and feelings. Sometimes those beliefs are paradoxical. When two conflicting beliefs are part of the same idea it can create paralysis. Procrastination is the manifestation of those paradoxes. If you’ve ever said “I really should be doing something else right now” and you don’t define that other activity or take steps to do the more important thing then you are holding a paradox of belief. The evidence is your frustration, hesitation, or procrastination. No need to judge it, merely recognize the conflict so you can explore and give energy to the correct activity. When a client’s outcome doesn’t match an intention, then something needs to change in their process. We coach the person to help appreciate the current process with an eye on refining our results. We tune the process until Intention aligns with Outcome. Intention is a desire to achieve an outcome. What areas in your own life contain paradoxes of belief that are keeping you in a fixed loop of behaviors that you don’t like or want? Coaching can help you discover the real drivers in your “how I do this” process thus revealing the real opportunities for change. Neutralizing fears and anxieties around the areas keeping you stuck frees you up for more growth as a person and in your career goals. Contact me today for a complementary coaching conversation. Within a few minutes we’ll know if coaching is a way to move out of frustrating repetitive patterns and start building a life that is more like the one you want.